Here’s how I usually celebrate St. Patrick’s Day. I’m out running errands with my kids. As I push my cart down an aisle at Target, I notice a little girl with an adorable green outfit. While passing, I smile and compliment her cute green hair bow. I keep shopping and stop by a woman who has on some lavish green nail polish. I naively continue on my way until a boy runs pass me with a green shirt on. I stop. It’s St. Patrick’s Day! I quickly scan myself and my kids searching for any sign of green. Nope. No green. Since I want to spare my kids from a pinch-happy child at our library class, I head to find some green stickers or green ribbon or green face paint. Just something GREEN, people! I’m usually unsuccessful and decide to take the risk and head to the library anyway despite being green-less. We get home, a few pinches later, and I promise myself to remember next year’s St. Patrick’s Day. Am I the only mama out here forgetting the green? 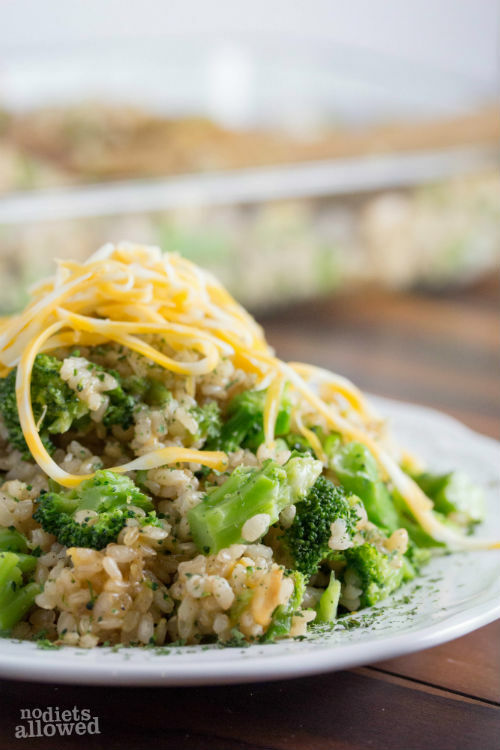 Well, whether you remember or not, at least you can sneak some green into your day by making this quick and easy Broccoli, Cheese, and Rice Casserole. I love cooking with fresh vegetables. Not only do they have a bold dynamic flavor, but the colors pop. Especially broccoli! I mean look at how beautiful and bright the green is! What? Doesn’t everyone get giddy over the vibrant colors in their food? Apparently, neither does my husband. Whenever I cooked with broccoli, I started noticing that the only thing left on his plate was the broccoli. Hmmm… oh, how I love challenges like this. So, for this gorgeous broccoli casserole, I decided to chopped my florets into pretty small pieces. AND he loved it! No leftover broccoli florets this time. 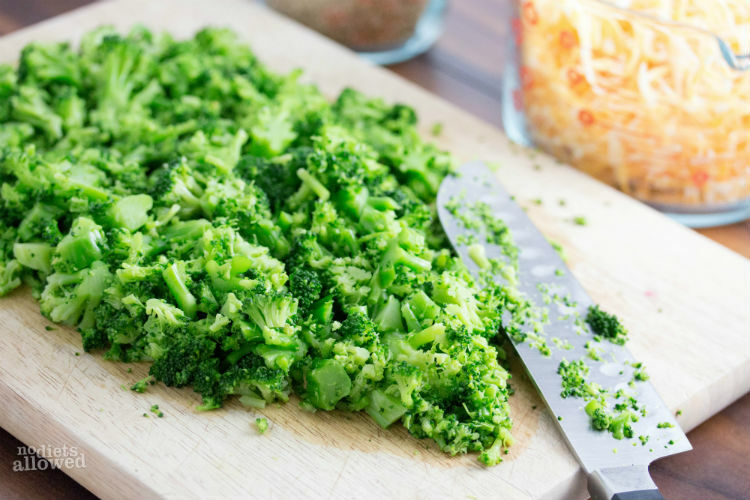 Finely chopping the broccoli kept the flavor and fabulous nutrients but made it easier to chew and savor the taste. Mission accomplished. I’m converted to organic produce. Although I hope I’m gaining a little of your trust by now, you don’t have to just take my word on how much better organic is. Let’s try a little experiment. Pick one fresh fruit or vegetable such as an apple or carrot. Purchase one organic apple/carrot and one regular apple/carrot. Compare the color, taste, texture, and quality. I started having horrible aftertaste with regular fresh carrots, broccoli and apples. I tried organic, loved the taste and am now completely hooked. 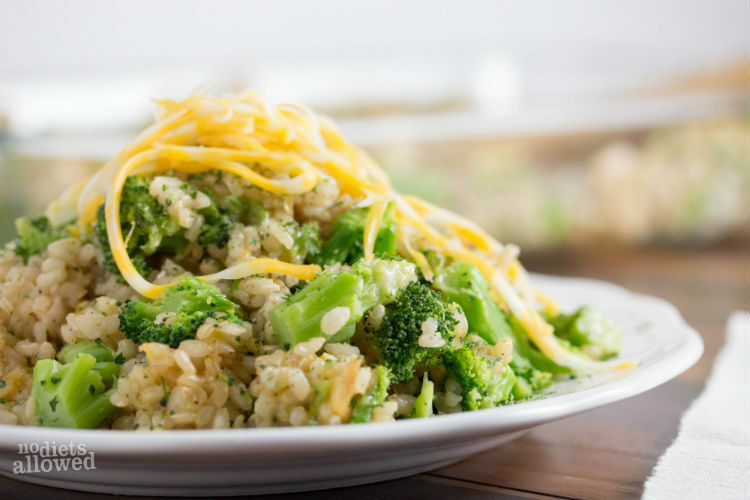 Purchasing organic broccoli for this recipe is totally worth it! At Costco, I purchase frozen organic broccoli florets (four 1 lb bags) and have loved the quality and taste. It also makes it really easy to whip up this recipe. 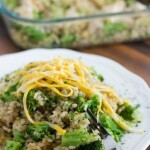 Speaking of the recipe, I guess I should finally share how to make this easy Broccoli, Cheese, and Rice Casserole. I’m here to make your life easier and healthier. Don’t know how to get healthy? I’ve got you covered. Come join my 6 week or 21 day health challenge! A current challenger just wrote me, “This has given me the boost I’ve needed for so long. I’m finally feeling healthy and unstoppable. Best game I’ve ever joined! I don’t think your ever getting rid of me.” A couple also lost 26 pounds together last round! Come play and discover how great it feels to be healthy! In a large saucepan, combine water, salt, and pepper and bring to a boil over medium-high heat. Add rice and cover. Lower heat to low-medium and simmer for 25 to 35 (brown rice takes a little longer) until rice soft and fluffy. Grill chicken breasts (or bake according to package directions) and cut into 1 inch pieces and place in large bowl. Also, finely chop broccoli and add the the large bowl. 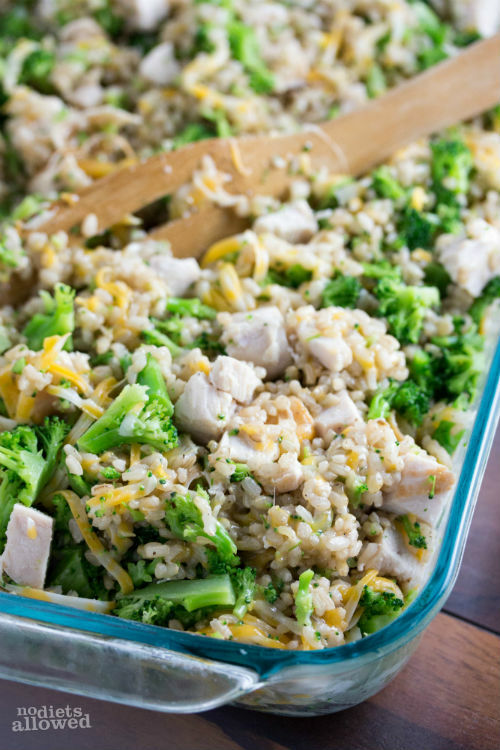 Once rice cooked, transfer to bowl with broccoli and chicken and mix well. Add cheese and stir well. Spray 9x13 baking dish with olive oil cooking spray. 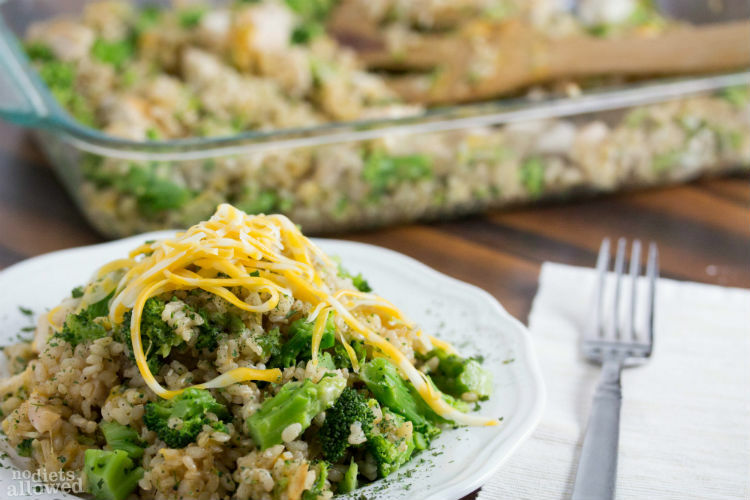 Spread broccoli/rice mixture evenly in the baking dish. Bake, uncovered, for 15 minutes until heated through. Serve warm and enjoy! How many people does this recipe serve. Thanks! I can’t wait to try it. It’s serves about 4 to 6 people, Denise. I hope you enjoy it as much as we do!